Printed in July 1959, this illustration by an unknown but very groovy artist of the 1960 Dodge Forward Control route delivery van calls to mind not just clinking glass bottles but L.A., David Hockney, swimming pools and families named Manson. Quonset Huts are “home” to service men in many theatres of war. Their delivery to ports of embarkation is an exacting, heavy-duty job. So W.J. Halloran, Providence, R.I., relies on Autocar heavy-duty trucks to deliver Quonset Huts on time. “They have not let us down.” Performance of this sort, the Nation over, presages big trucks . . . more powerful transports . . . Autocar Trucks . . . in the days to come. From 1944 and the latter part of World War II, another of William Campbell’s storybookish illustrations for Autocar Trucks. They find fun in many things and Pepsi-Cola is always a part of their fun. Why not join The Sociables — and start enjoying the modern taste of Pepsi-Cola now. The subject of this 1959 illustration by Lynn Buckham is hothouse flowers — one in a clay pot and the other in a wool sheath. You really can’t get much more soignee than this, especially when your libation is a glass of soda pop and the strongest drink in the house is fish emulsion. If you’re a Printer Project II subscriber, your jumbo-format print has been made and will be shipped in the coming week. Thanks to all who participated! Our order pages in the Gift Shop have been updated to include extra-large-format prints. From 1953, two nice billboard-style illustrations for Hamm’s Beer, brewed in “the land of sky blue waters”: A cold one on ice (or in ice), and also under a full moon. ≈ The New Step-Down Ride! Most Room! Best Ride! Safest! Your own eyes will tell you in short order that the sleek, low-built, streamlined Hudsons achieve a measure of beauty long sought by automobile designers the world over, that here is the lowest built car of all. It’s the new “Step-Down Ride” . . . a luxurious, infinitely better way of motoring that makes the new 1950 Hudsons the sensation of the motor-car world. From 1957, an illustration by one G. Brusstar for GM’s OK Used Car dealers shows what looks like a Gilbert Stuart portrait of George Washington being loaded ino a 1955 Chevrolet Nomad. Either of which would be worth quite a bit today. This 1959 illustration for Pepsi is by Bob Peak, often described as the father of the modern movie poster. At Plan59 he’s also represented by his artwork for the Comet. The regal 1961 Cadillac Sedan de Ville pauses on a side road in the snow-clad Colorado Rockies, and some admirers come up to visit and beg for food. 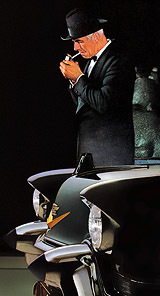 The 1961 Cadillac as portrayed by Stan Galli. Observation by our friend the illustrator Joan Auclair: How creepy that the woman is wearing predator fur. Those deer should be afraid, very afraid. Two from Stan Ekman: Dishwasher Daredevils (1959) and the Angry Angler (1958). The beautiful new Plymouth enjoys an enviable reputation with discriminating motorists because under its beauty they discover solid value. They find the unsurpassed driving ease of the new PowerFlite fully automatic transmission combined with the 10% higher horsepower of the new PowerFlow engine . . . The 1954 Plymouth Belvedere in Ugly Duckling Yellow. Three years later it would turn into a beautiful swan. From the drawing boards of Bohn Aluminum in 1947, a “future motorcycle” that never saw the light of day. We wonder how this would go over in Daytona Beach. From late 1958, an ad showing half of the ’59 Chrysler. Through the magic of Photo- shop we’re able to show you the entire car, which amazingly has two steering wheels. The 1954 Chevrolet, giant butterfly notwithstanding, was something of a styling frump and did not become truly beautiful until the 1955 model year. Two renderings by the children’s book illustrator Winnie Fitch. Sure, they enjoy life, these modern people. Their good looks and slender figures are a pleasure to each other — and to everyone around them. Active men and women of ’56 keep slim and fit through their sensible eating habits. Their up-to-date taste is for the lighter, less filling foods and drink. Today’s Pepsi-Cola goes right along with this wholesome trend in diet. Reduced in calories, never heavy, never too sweet, Pepsi-Cola refreshes without filling. Have a Pepsi — the modern, the light refreshment. In the olden days of 1956, “modern” was a selling point, worth mentioning twice in this ad for Pepsi-Cola. Pass the mustard. More franks on the beach from 1956, when weenies were evidently very big. Cover illustration from an early 1950s Massey-Harris brochure. If anyone knows the exact year, please drop us a line. The equipment for even bigger prints arrived this afternoon. Some assembly required. Printer Project subscribers should receive their prints starting next week and continuing through to the end of the month. ≈ Cleanup on Aisles 1, 2, 3 . . . Anybody checking the shopping habits of artist Pete Hawley’s young bombardier and his pilot will find the job’s an easy one. All stops are plainly marked by the heaps. All, of course, except the last one — where she’ll have to go get a new box of sugar! Wonderful 1957 artwork by Pete Hawley, house artist first for Jantzen in the 1940s and 50s and then AT&T (Betsey Bell) circa 1959-1963. Then he seems to have dropped out of sight. ≈ Who’s Got the Greatest Getaway? The 1956 Buick CENTURY can go from standstill to 25 miles per hour in 3.7 seconds flat. But that’s stunt stuff. All by itself, it doesn’t tell you who’s got the greatest transmission for day-in, day-out driving. It’s when you try today's advanced new Variable Pitch Dynaflow that you find all the answers to a superlative degree . . . The new printer arrives this weekend, so not much time for bloggerel. Your home will be a push-button miracle . 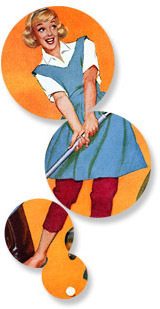 . . electronic “maids” will cook and clean by magic. How would you like to be able to bake a two-layer cake in a cold oven in six minutes? Press a button and have ultrasonic, or silent, sound waves wash the dishes? Turn a knob and see an electronic jigger iron your little daughter’s dress? It’s all in your future — all in the house that’s going to be a reality at a time not very far away. With push-button control, you’ll make your rooms any size you wish any time. Perhaps your house will be all plastic. Smaller homes will combine living room, dining area and kitchen area in one space, with your 3-D color TV set on one wall and a phono-vision device allowing you to see the person whom you are telephoning. The microwave oven, a piece of electronic magic already in production, will be growing in use. You’ll mount it in the wall. Your push-button refrigerator will pop out ice cubes, crushed ice and ice water; it will carbonate water and, of course, thaw and dispense frozen foods. The development of hybrid varieties of fruits and vegetables offers enormous possibilities — new species will come about through atomic radiation of seeds. You can look for grapes as big as plums, strawberries the size of apples . . . Some of the items in Fred McNabb’s wonderful 1956 illustration and accompanying text were right on the money while others were the stuff of the Jetsons (and we wonder if his mid-fifties artwork had any influence on the creators of that cartoon). The closest it comes to anything like computers or the Internet is “phono-vision.” They promised us the future, but what we got instead was the 1970s. You’ll still be young at 90, live in push-button homes, wear air-conditioned clothes, drive jet cars and ’copters, and rocket to Europe in an hour. You’ll have microwave cookstoves, a telephone in your purse and atomic pills for what ails you . . .
A 1956 illustration by Fred McNabb, who also did the future-themed New Departure ball-bearing ads for GM. Note the flat-panel TV. Or, The Boy With Socks Appeal. This 1952 cover illustration by Arthur Sarnoff was based on an idea by his wife Lillian, “who came home one night and reported she’d seen — of all things! — a MAN knitting” a pair of argyles. Will wonders never cease. October 4, 1953: This was a good week for you non-baseball fans to head for the hills. The offices, schools and kitchens of the land have been a-chatter with bloopers, sliders, liners, RBI’s and bobbles — and other foreign-sounding noises. This kind of thing goes on all summer, but since the World Series started, it’s become the mother tongue from coast to coast. Except at Ebbets Field or Yankee Stadium, life’s been at a standstill. Cakes go unbaked, homework undone, and — as artist Carol Johnson shows here — lawns go unraked. All in all, it’s pretty wonderful but it would be heaven indeed if the wheelbarrow people would only make one with a foam rubber lining, a hot-dog dispenser and a faucet for lemonade! Carol Johnson’s illustration of a body at rest graced the cover of American Weekly, a Sunday supplement for the Hearst newspapers that was similar to Parade magazine in format but more like National Enquirer in content. At its peak the magazine, which was published from 1896 to 1966, claimed a circulation of 50 million. Today’s stylists are doing wonders for the looks of modern woman. But give some credit, too, to the woman herself. For the modern figure is her own creation. Her greatest care and pride is to keep that figure young. Her taste, therefore, is for lighter foods and lighter beverages. This is the way of living that gives her the slender lines that fashion insists on, that men admire, that health authorities and insurance companies applaud . . .
Eggs. Bacon. 1958. We are hungry and highly suggestible. Must find . . . parsley. Another American Weekly cover by Bob Hilbert, this one from Feb. 14, 1954. Extra prestige! Make your choice America’s choice. Own the car that leads in popularity, year after year. Extra beauty and quality! With graceful, flowing lines of Body by Fisher. Extra quality, finer workmanship in every detail. The rest of this ad for the 1952 Chevrolet is here. ≈ More Horsepower Per Dollar! What the motoring public wants today is power. Power for performance! Power for safety! Power for thrilling new driving ease! That’s why Oldsmobile’s Super “88” — with more horsepower per dollar than any other car you can buy — is such a sought-after value. It brings you the eager action of the famous 160-h.p. “Rocket” Engine. PLUS! . . . Hydra-Matic Super Drive . . . GM Hydraulic Steering . . . the revolutionary Autronic-Eye . . . and the smartest, sleekest lines you ever saw. Make a date with this “88” . . . soon! From July 1952, it’s your grandfather’s Oldsmobile.